Introduction: Laparoscopic Roux-en-Y gastric bypass (RYGB) is well recognized for its efficiency in terms of weight loss for morbidly obese patients. Anastomotic strictures present in 5-15% of cases and have a significant impact on the patient’s quality of life. The aim of this study was to evaluate the frequency of anastomotic stritcure in our center and report our experience in treating refractory cases. 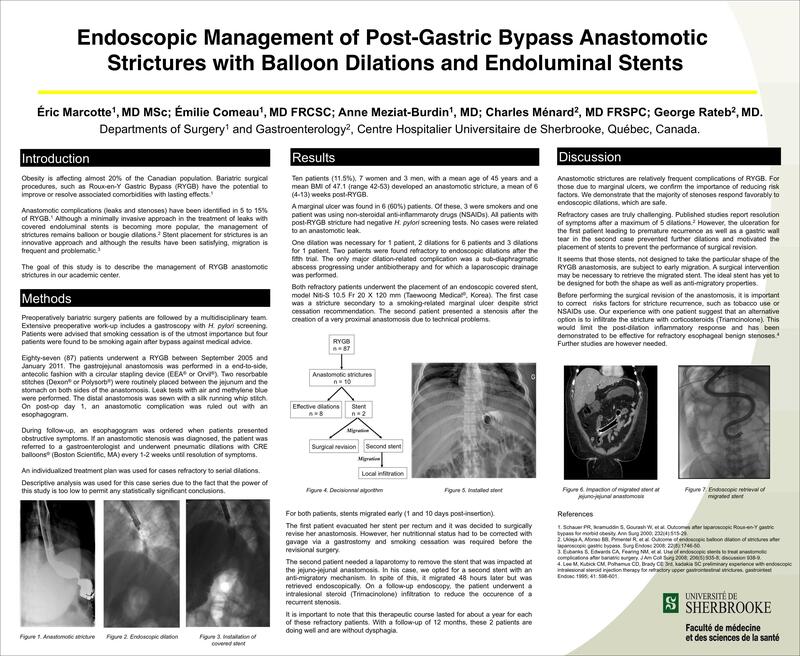 Methods: Data from all patients presenting with a post-RYGB anastomotic stricture were retrospectively collected and analyzed. The first step in their management was endoscopic balloon dilation. Refractory cases underwent endoscopic placement of fully covered esophageal stents. Results: Eighty-seven patients underwent LRYGB in our center between September 2005 and January 2011. Eleven patients (12.6%) presented a gastrojejunal anastomotic stenosis, a mean of 6 weeks post-LRYGB, of which 6 patients (55%) had a marginal ulcer. One to three dilations were necessary for the majority of patients, but 2 patients were still unable to feed after five interventions. A sub-phrenic abscess was the only major complication of pneumatic dilations. For the 2 refractory patients, stents migrated early. The first patient underwent surgical revision of the anastomosis. After failure of placement of a second stent, the other patient was successfully dilated and the site of the stricture was locally injected with triamcinolone acetonide, which prevented further recurrence of the stenosis. Conclusions: The majority of patients with RYGB gastrojejunal anastomotic stricture respond favorably to endoscopic pneumatic dilations. Refractory cases are challenging. Stents are aimed at preventing a complex surgical reintervention but are not yet designed for that use. Local infiltration of corticosteroids at the time of dilation seems to prevent recurrence of the stenosis.